When it’s time to update the strength and appeal of your home, consider waterproof flooring in Sherman Oaks, CA. At our showroom, we offer the materials and resources you need to take your interior design to the next level. Our selection of flooring provides a wealth of options so that you can meet your interior design goals. Arrange a consultation today and find the right products for your next project. As its name suggests, “waterproof flooring” is a category that includes materials that are specifically designed to resist water and other liquids. As such, this collection of flooring is a great choice for the active family with children and pets. Although this flooring category is available in different types, they share common benefits. The prominent advantage is ease of maintenance. Since these materials resist water, spills and stains are no big deal. This type of flooring can stay new and sturdy using an approved cleaner and a cloth. For carpets, many spills disappear by blotting it out. This flooring type is also resilient. Waterproof carpet is not only easy to clean and able to withstand wear and tear, but it’s also soft and plush, making it a safe choice for children. Other materials, like laminate and vinyl, are specially manufactured to withstand heavy foot traffic, scuffs, and scrapes. Waterproof floors are also a great choice to flex your creativity. Since this category incorporates many different materials and flooring types, your interior design options are limited only by your imagination. From modern chic to rustic flair, our showroom has flooring that will complement your room and furniture. Carpet: Waterproof carpet incorporates special dyes, fibers, and textures to create a surface that is as tough as it is elegant. Choose flooring in a variety of different colors and highlight your common area. 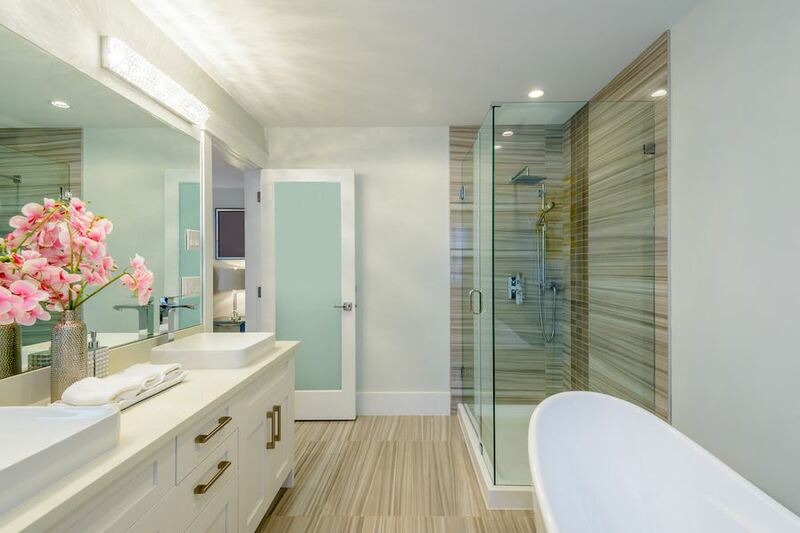 Vinyl: Waterproof vinyl flooring is a versatile material that goes virtually anywhere, from the living room to the bathroom. Thanks to advanced manufacturing methods, this material is available in the appearance of other materials, like wood and ceramic. Laminate: Waterproof laminate flooring has a pleasant underfoot feeling while retaining a resilient surface. The tough “wear layer” resists all sorts of spills, including pet accidents. Laminate is quick to install, making it a great choice when your project has a tight schedule. Make sure your investment serves you well for years. Our showroom also coordinates waterproof flooring installation according to your schedule. We work with experienced and qualified installers, allowing your selection to look its finest. From choosing the material to providing waterproof flooring installation, our company is committed to helping your remodeling project succeed from start to finish. Contact us to arrange a consultation for waterproof flooring. We proudly serve property owners throughout Sherman Oaks, CA, including Studio City, Valley Village, North Hollywood, and the surrounding area.